Registration is open for the 2018 Annual Steward Meeting taking place on Wednesday, October 24 from 1:00 to 3:00 p.m. Eastern. Learn about program performance along with next year’s program budgets and material fee rates. The meeting will be held via webcast. Click here to register. The MCD Project is well into its second phase – the pilot test phase. Resource Recycling Systems (RRS) has been designing the procedures for measuring the impacts of material characteristics such as density, size, form and ease of compaction. Where necessary, the procedures will be refined prior to Phase 3, in which a series of studies will ensure the results are comprehensive enough to be used as inputs to the fee setting process. Click here to learn more. New Voluntary Stewards who wish to start reporting in 2019 are asked to submit a Voluntary Steward Agreement (VSA) for each respective program by December 1, 2018. Existing Voluntary Stewards who wish to cancel their VSA and not report in 2019 are reminded to notify the program(s) by December 1, 2018. Click here for more information. Coinciding with the September meeting of G7 environment ministers in Halifax, a number of companies have created a new organization that seeks to advance Canada’s efforts to create a more circular economy. The mission of the Circular Economy Leadership Coalition (CELC) is to provide thought leadership, technical expertise and a collaborative platform for the development of pioneering solutions that eliminate waste at all stages of the life cycle of products. CSSA Executive Chair John Coyne, in his role of Vice-president of Legal and External Affairs at Unilever Canada, co-authored this article that provides background on the creation of CELC. Reduced revenue from commodity sales and the addition of waitlist communities will increase the Recycle BC budget for next year. China’s ban on imported waste, which took effect January 1, 2018, has depressed prices and created a fundamental shift in commodity markets. The program’s plan requires eligible communities be added to curbside collection as soon as practical – five joined in 2017, with a further six joining by the end of 2018. The Board of Directors will finalize the budget and 2019 material fee rates at its September meeting. Thank you to all who submitted feedback on the revised program plan. The plan will be reviewed by the Recycle BC Board of Directors in late September. If approved, it will then be sent to the BC Minister of Environment and Climate Change Strategy for approval. Once the plan is submitted to government, stewards will be advised that the plan and consultation report are available on the Recycle BC website. 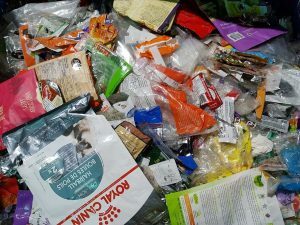 A total of 130 BC depots are now accepting Other Flexible Plastic Packaging (OFPP) materials as part of a research and development project led by Recycle BC. The project will determine how best to recycle materials in this category, which is one of the fastest growing packaging types on the market, and one of the largest categories of packaging not previously collected under the residential recycling program. 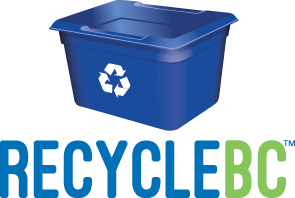 As of January 1, 2019, all Recycle BC depots will collect OFPP. Learn more here. The MMSW board has approved a model recommended by the Advisory Committee that will increase payments to municipalities for the collection and processing of designated materials. The model was required as part of the program plan and the increase is the first since the inception of MMSW. The new payment model becomes effective January 1, 2019, and will increase the program’s annual budget by approximately $4.5 million. Click here for more information. 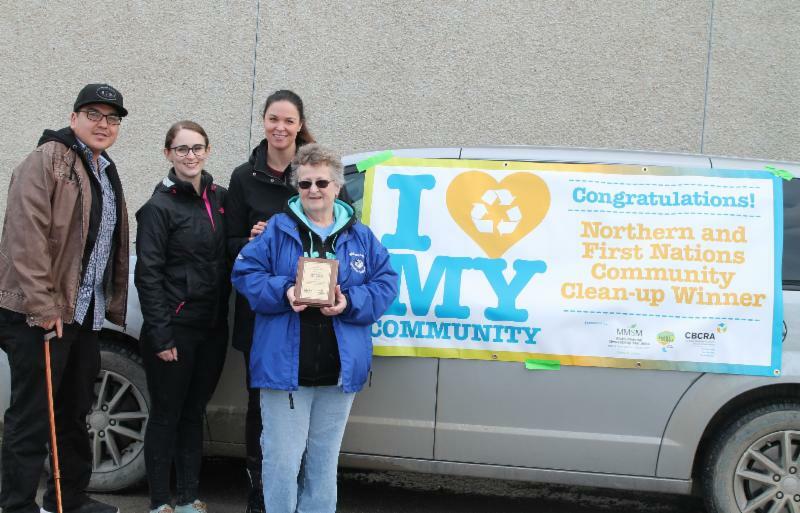 MMSM is pleased to announce Bloodvein First Nation as the winner of the 2018 Northern & First Nations Community Clean-up. Staff recently traveled to Bloodvein to host a celebratory barbecue. MMSM will be installing permanent signs customized to the recycling needs of the community to inform residents about what can and cannot go into their local recycling system. MMSM will also be providing educational materials to community members that will teach them about the accepted materials, the benefits of recycling, and its impact on the environment. MMSM’s Municipal Services team spent a lot of time this summer visiting various communities to review efficiency opportunities. Staff provided technical support so municipalities can optimize their residential recycling programs, while keeping costs down. MMSM’s sponsorship of the Winnipeg Goldeyes baseball game on July 26 promoted the ‘Bag it Forward’ program with fans donating their gently used plastic bags. 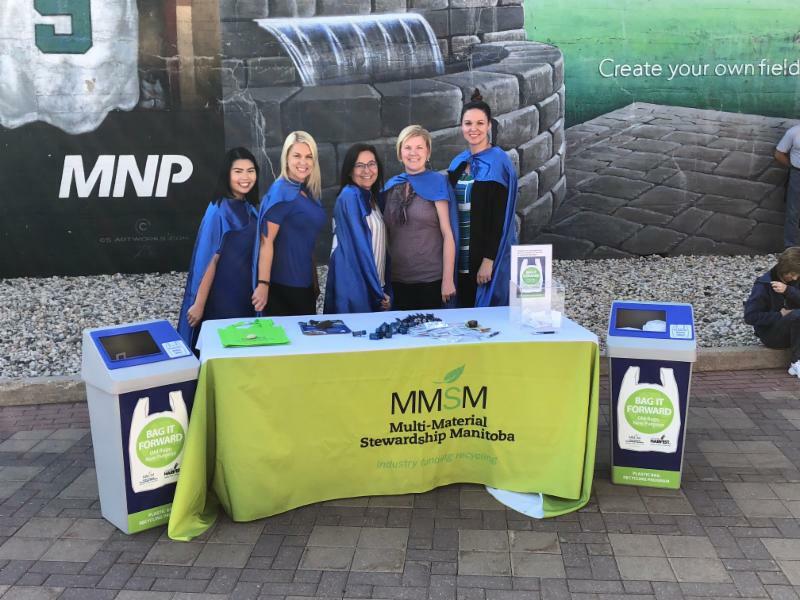 An MMSM booth at the game in Winnipeg collected more than 1,400 plastic bags throughout the evening. The game was also a superhero theme game, tying into MMSM’s current campaign “Be a Recycling Superhero”. Fans and MMSM and Goldeyes staff dressed up in superhero outfits and recycling themed in-game promotions took place throughout the evening. – Re-run of last year’s ‘break the cycle’ campaign focusing on reducing recycling contamination in multi-residential buildings. – Hazardous material awareness campaign, joint with AMS, highlighting the five materials residents can take to a drop-off location. 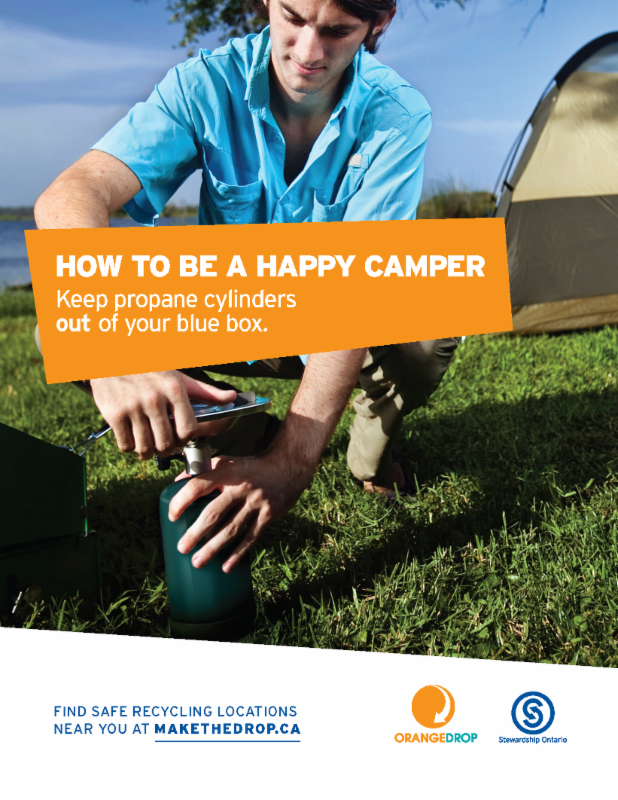 – A campaign targeting campers and picnickers about how to safely dispose of propane cylinders. – Continued partnership with Ontario Parks promoting safe disposal of propane cylinders through social media, blog post, e-newsletter and in-park ads. Ad templates were made available for municipalities to edit and use for their own advertising. 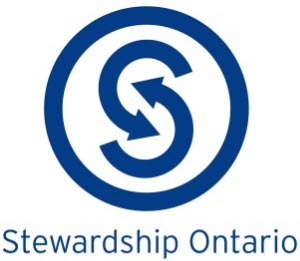 The Resource Productivity and Recovery Authority has set the 2019 Blue Box Steward Funding Obligation at $126.4 million. The Blue Box Steward Funding Obligation is the total amount that stewards must pay to municipalities for the Blue Box Program. The 2018 obligation was $124.8 million. Click here for more information. The AMS Board of Directors has approved a 2019 fee schedule that maintains 2018 rates for antifreeze, antifreeze containers, oil containers and large oil filters, with a decreased rate for the small oil filter category. Click here for more information. If you have any questions about any of the programs, please feel free to call the National Steward Services team at 1-888-980-9549 or email stewards@cssalliance.ca.